72 hours continuous rain here, one day sunlight and then again 72 hours continuous rain which still continues… schools closed , kids and husband at home for past three days… best way to keep them Busy?? so my today’s menu is healthy and tasty Nadan Chicken Curry Recipe with whole wheat kubbos. I prepared this curry in coconut oil. Marinates the chicken with Pepper , salt , turmeric, 1/2 tbsp ginger & 1/2 tbsp garlic paste 1 hour. 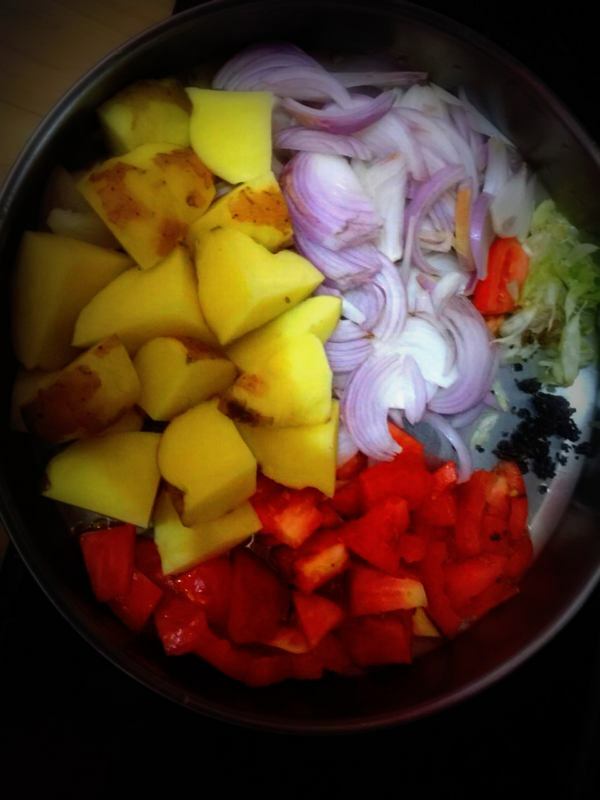 Chopped onion , potato tomatoes keep aside. Heat a tablespoon of oil in a pan and splutter mustard seeds. Add crushed ginger and garlic and Onion sauté till raw smell goes off. Add chopped shallots and curry leaves and sauté till light brown color. Add Potato and sautee nicely. Add Sliced Tomatoes and sauté till soft. Mix turmeric powder, red chilli powder and coriander powder and Eastern Chiken Masala. with some water and make a paste. Add the paste to the sautéed shallots and sauté till raw smell goes off. Slow cook with the pan covered. Add garam masala powder when chicken is almost cooked. Again cook for 5 more minutes with the lid on. Open the lid and add curry leaves (optional) and a tablespoon of coconut oil, gently mix and switch off the flame. Keep the pan covered for 10 more minutes for getting more flavor from coconut oil and curry leaves.